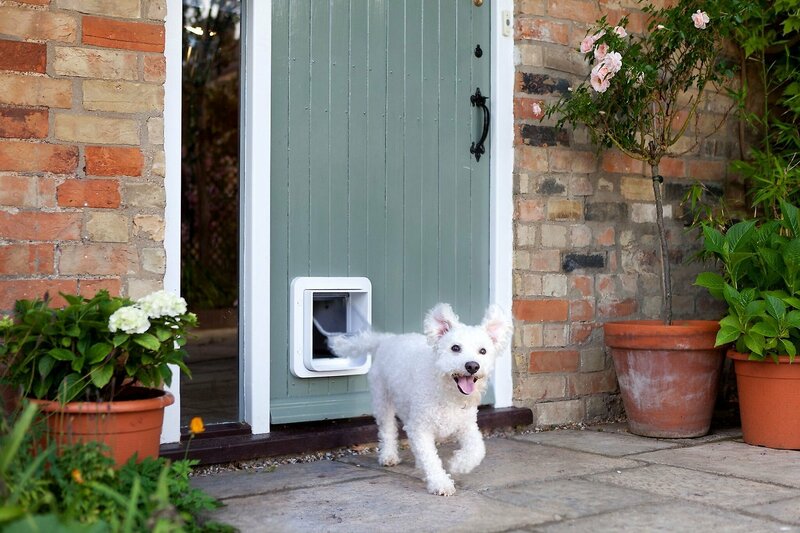 Give your furry pal a safe way to get inside while keeping unwanted guests out with the SureFlap Microchip Small Dog & Cat Door. Just like giving your pets their own house key, this flap door is smart enough to know who’s allowed in and who’s not. It works by picking up on the unique microchip or collar tag on your dog or cat, and only opens to let him in, while staying closed for all other animals. Simply program in your pets’ microchips with just one button―you can store up to 32 pets in the system―and install on any door, window or wall. Perfect for large cats and small dogs, it features multiple modes to control when your furry ones go in and out, including a curfew mode that locks or unlocks automatically at a set time. It’s compatible with all microchips and includes one RFID collar tag to use if your pal isn’t microchipped. Flap door knows your pets’ unique microchip or collar tag id and only opens for them; sized for small dogs and large cats. Flap stays locked for any other animal, keeping unwanted animals safely and securely out of your home. Easy to program with just one button and can remember up to 32 different pets; compatible with all microchips or RFID collar tags. Lets you control your pets’ comings and goings, with different modes including curfew mode which locks and unlocks automatically at a set time. Easy to install on any door, window, or wall and includes a RFID collar tag for a pet that’s not microchipped; batteries not included. Main Door Assembly, External Frame, Battery Compartment, (2) Battery Covers, Button Cover, Buttons, LCD Screen, Indicator, Light, Double Locking Mechanism, Draught Excluder, Selection of Screws, Screw Caps, SureFlap RFID Collar Tag. 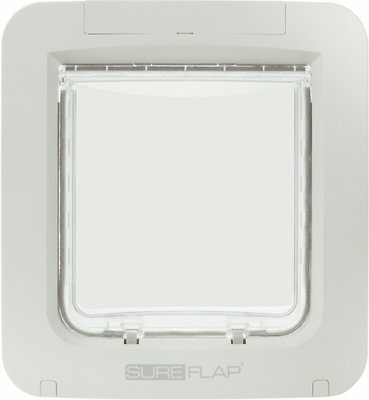 Use SureFlap Dog & Cat Door Mounting Adapter for installation in glass doors, windows, or walls. Program your cat's microchip at the touch of a button. You cat's microchip is then permanently stored in memory. 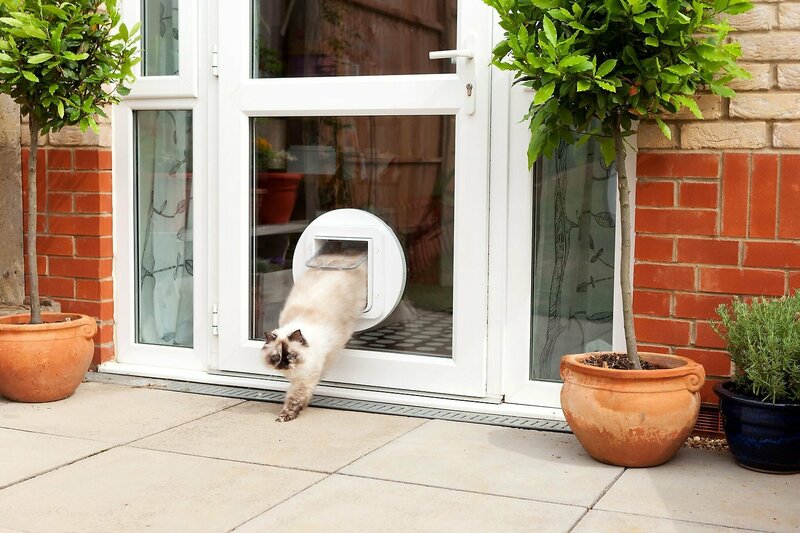 Install the cat flap in a door, window or wall. The cat flap unlocks when your pet approaches. It reads the unique code on your pet's microchip for collar tag. Use the curfew mode to keep your pet indoors. Set the door to lock and unlock at any time of the day or night. Intruder animals can't get in. The cat flap remains locked for unwelcome cats and wildlife. The unit may be cleaned with a damp cloth, being sure to remove any hair or debris from the optical sensor on the roof of the tunnel, just behind the door. My pet isn't microchipped, can it use Sure Petcare microchip products? We recommend you use Sure Petcare products in conjunction with your pet's implanted microchip so that they don't need to wear a collar. However, Sure Petcare products can be used with a Sure Petcare RFID Collar Tag that is unique if your pet is not microchipped. The Micorchip Pet Door, the Microchip Pet Door Connect and the Microchip Pet Feeder come with one collar tag supplied. Collar tags are not supplied with the Microchip Cat Flap and the DualScan Microchip Cat Flap and can be purchased separately. Where can I find the serial number of my Sure Petcare product? 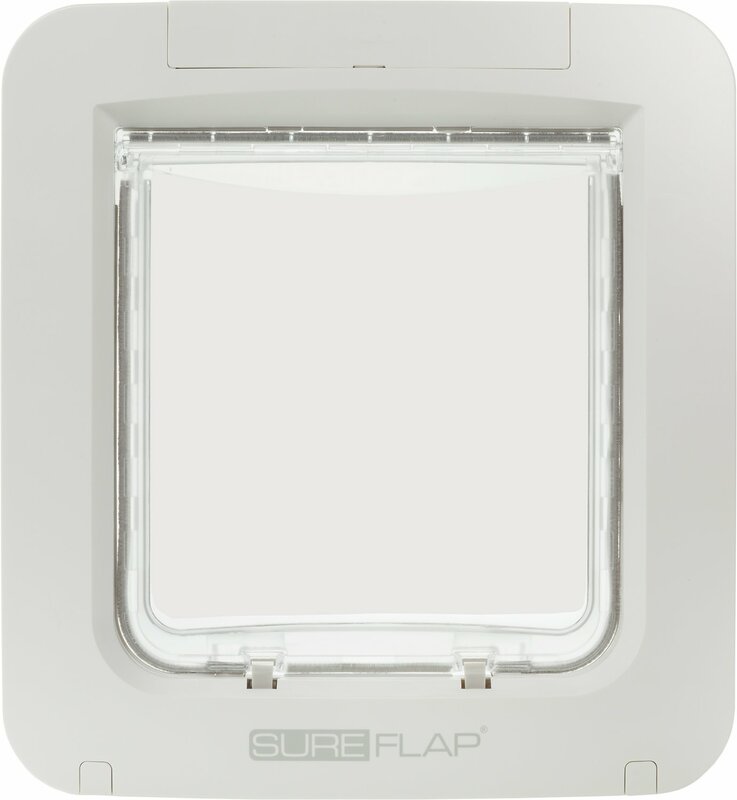 The serial number of the SureFlap Microchip Cat Flap and the SureFlap DualScan Microchip Cat Flap can be found on the underside of the battery compartment lid. The serial number of the SureFlap Microchip Pet Door and Microchip Pet Door Connect can be found on the underside of the button compartment lid. The serial number of the SureFeed products (Microchip Pet Feeder & Sealed Pet Bowl) can be found on the underside of the product. What kind of batteries do you recommend using with Sure Petcare products? The SureFlap Microchip Cat Flap and the DualScan Microchip Cat Flap operate using 4 AA (1.5V) batteries. The SureFlap Microchip Pet Door, SureFeed Microchip Pet Feeder & SureFeed Sealed Pet Bowl operate using 4 C cell (1.5V) batteries. We recommend the use of good quality, alkaline batteries in order to give the longest lifetime. We do not recommend the use of rechargeable batteries with Sure Petcare products. How long will the batteries last in my SureFeed product? The batteries on your SureFeed product should last a minimum of 6 months with normal use. This battery life is expected when using good quality, non-rechargeable, alkaline batteries. Cat is able to pull door open and escape. Useless! Considering the price of this cat flap I would expect a better design. Cat is able to escape by hooking his claws under the side of the plastic flap, standing on the grey release button with the other paw, and pulling the door toward him. Absolutely useless! We have 2 dachshunds (14 and 17 pounds each) - this door is perfect for them and they fit with no problem. They can go in and out as much as they want. Their nose is a little long so the microchip activation for coming back in takes a little getting used to from the dogs. One dog we put the collar tag on and it works perfectly. The other dog seems to not mind that it takes a while. I have heard too that there is another setting that makes the sensor have a broader reach if you call customer service. I still plan to do that too. I followed the instructions. The chip reader worked. Both cats were programmed and I could see the door was opening and functioning as expected. The manual says the reader will remember the chip even if you take the batteries out. So... we installed it. I put the batteries back in and it will not pick up the chips. I called Chewy. The lady gave me an 800 # that is a a non working number. She did not know if it was an international number or a domestic number. Come to find out it is a 'nonworking' number. Great device to let the cats go in and out at the time I like them to go out and other pets, ragoons etc cannot enter. Works very dependently.